NAV Valuation & Advisory LLC (“NAV”), a leading valuation firm dedicated to the alternative investment industry, launched its inaugural Fund Benchmarking Report yesterday. The NAV Fund Benchmarking Report is a complimentary report which presents over 90 pages covering market commentary and analysis of industry trends. The Report also contains an additional 125 pages of multi-year data points in Appendix A. Appendix A is a comprehensive financial statement and valuation analysis of the public-traded private equity industry. Click NAV Launches Fund Benchmarking Report for the full press release or click the image to download the free NAV Fund Benchmarking Report. NAV Valuation & Advisory LLC (“NAV”) President Justin Kuczmarski recently appeared on Stateside, the prime time news program of i24, to comment on the impact of corporate tax cuts on stock buybacks. Click the image below for the full TV interview. NAV Valuation & Advisory LLC (“NAV”) President Justin Kuczmarski recently appeared on Clear Cut, the nightly news program of i24, to comment on the Sprint and T-Mobile merger rumors. NAV Valuation & Advisory LLC (“NAV”) President Justin Kuczmarski, MBA, CPA, CVA, ABV, CIRA, recently appeared on China 24, the nightly news program of China Global Television Network (CGTN), to deliver insights into emerging facial recognition technology. NAV Valuation & Advisory LLC (“NAV”) President Justin Kuczmarski, MBA, CPA, CVA, ABV, CIRA, recently appeared on Clear Cut, the nightly news program of global channel i24, to discuss KKR's proposed acquisition of WebMD. Mr. Kuczmarski appeared on the Monday, July 24th broadcast. Kuczmarski stated that Alphabet's Google search engine would rebound from the EU ruling and that digital video advertising remains the critical area to watch in the years ahead. The full press release and interview link can be found by clicking here. NAV Valuation & Advisory LLC (“NAV”) President Justin Kuczmarski, MBA, CPA, CVA, ABV, recently appeared on Clear Cut, the nightly news program of global channel i24, to discuss Amazon's proposed acquisition of Whole Foods. Mr. Kuczmarski appeared on the Friday, June 16th broadcast. In discussions with Anchor Michelle Makori, Kuczmarski noted that diversified synergies, the enviable brand of Whole Foods, and operating margin growth were all prime drivers for the acquisition of the organic food pioneer. NAV Valuation & Advisory LLC (“NAV”) President Justin Kuczmarski returned to China's leading TV station, CCTV, to discuss the July 14, 2016 record IPO for messaging app Line and the tech IPO outlook overall. The full 6-minute interview can be found below. NAV Valuation & Advisory LLC (“NAV”) President Justin Kuczmarski was named a 2016 recipient of the "40 Under 40" award by the National Association of Certified Valuation Analysts (NACVA) during the valuation organization's annual national conference in San Diego. “The 40 Under 40 recognition program was designed to give voice and opportunity to the next generation of industry mavericks recognizing their contributions to the profession, their communities, and their contributions yet to come,” stated Brien Jones, Chief Operating Officer and Executive Vice President for NACVA. Founded in 1990, NACVA is the largest and leading national valuation organization today. 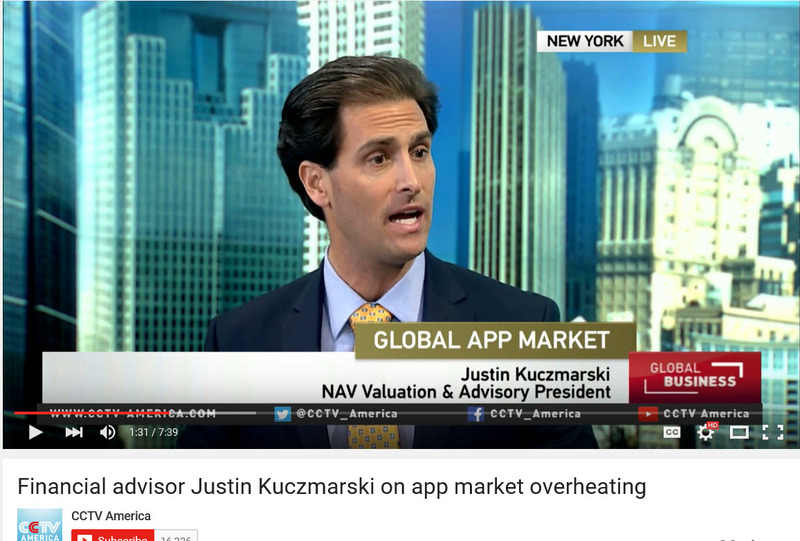 NAV Valuation & Advisory LLC (“NAV”) President Justin Kuczmarski appeared on China's leading TV station, CCTV, to discuss technology valuation and a potential overheating of app values. The full 7-minute interview can be found below.